In the past 50 years, humans have consumed more resources than in all previous history. U.S. EPA, 2009. Sustainable Materials Management: The Road Ahead. The way we produce, consume and dispose of our products and our food accounts for 42% of U.S. greenhouse gas emissions. U.S. EPA, 2009. Opportunities to Reduce Greenhouse Gas Emissions through Materials and Land Management Practices. Between 1950 and 2005, worldwide metals production grew sixfold, oil consumption eightfold, and natural gas consumption 14-fold. In total, 60 billion tons of resources are now extracted annually—about 50% more than just 30 years ago. Today the average European uses 43 kilograms of resources daily, and the average American uses 88 kilograms. Worldwatch Institute, 2010. State of the World 2010. Between 1970 and 1995, the U.S. represented about one-third of the world’s total material consumption. With less than 5% of the world’s population, the U.S. consumes 33% of paper, 25% of oil, 15% of coal, 17% of aluminum, and 15% of copper. U.S. EPA, 2009. Sustainable Materials Management: The Road Ahead. Nearly three quarters of what we throw away is products, with organic materials (food and yard waste) make up the remaining 25%. EPA, 2009. Municipal Solid Waste Generation, Recycling and Disposal in the United States: Facts and Figures for 2008. More than 100 billion pieces of junk mail are delivered in the United States each year, which comes out to 848 pieces per household. The production, distribution and disposal of all that junk mail creates over 51 million metric tons of greenhouses gases annually, the equivalent emissions of more than 9.3 million cars. ForestEthics, 2008. Climate Change Enclosed: Junk Mail’s Impact on Global Warming. The U.S. buried or burned more than 166 million tons of resources—paper, plastic, metals, glass and organic materials—in landfills and incinerators in 2008. 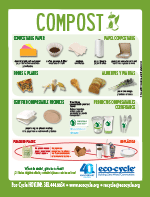 We recycled and composted only one-third of our discards. U.S. EPA, 2009. Municipal Solid Waste Generation, Recycling, and Disposal in the United States, Detailed Tables and Figures for 2008. An estimated 144 billion beverage containers were landfilled, incinerated or littered in the United States in 2005, approximately two out of every three containers sold. This amounts to 54 billion aluminum cans, 52 billion plastic bottles and jugs, 30 billion glass bottles, and about 10 billion pouches, cartons, and drink boxes. Container Recycling Institute, 2007. Water, Water Everywhere: The growth of non-carbonated beverage containers in the United States. Recycling, reuse and remanufacturing account for 3.1 million jobs in the U.S.—one out of every three green jobs. American Solar Energy Society, 2008. Defining, Estimating, and Forecasting the Renewable Energy and Energy Efficiency Industries in the U.S and in Colorado. Between 1990 and 2000, Americans wasted a total of 7.1 million tons of cans, enough to manufacture 316,000 Boeing 737 airplanes or enough to reproduce the world’s entire commercial airfleet 25 times. Since the first Earth Day in 1970, Americans have thrown away 910 billion cans worth over $25 billion in current dollars. Container Recycling Institute, 2002. Trashed Cans: The Global Environmental Impacts of Aluminum Can Wasting in America. It only takes about 6 weeks total to manufacture, fill, sell, recycle, and then remanufacture an aluminum beverage can. U.S. EPA, 2010. Common Wastes & Materials: Aluminum. Methane is 72 times more potent than CO2 over the short term, as measured by the 20-year time horizon. IPCC, 2007. Climate Change 2007: The Physical Science Basis. The “hole” in the stratospheric ozone layer over the Antarctic – the layer that protects people from harmful ultraviolet radiation – is now the largest it has ever been and is not expected to recover until between 2060 and 2075. United Nations Environment Programme, 2007. Global Environment Outlook 4: Summary for Decision Makers. Half the world’s tropical and temperate forests are now gone. U.S. EPA, 2009. Sustainable Materials Management: The Road Ahead. 75% of marine fisheries are now overfished or fished to capacity. U.S. EPA, 2009. Sustainable Materials Management: The Road Ahead. Only a few hundred of the more than 80,000 chemicals in use in the United States have been tested for safety. President’s Cancer Panel, National Cancer Institute, 2010. Reducing Environmental Cancer Risk: What We Can Do Now. More than 2 million people globally die prematurely every year due to outdoor and indoor air pollution. United Nations Environment Programme, 2007. Global Environment Outlook 4: Summary for Decision Makers. Coloradoans recycled 19.6% of our discards in 2008. Excluding scrap metal recycling, our recycling rate drops to 9.3%. 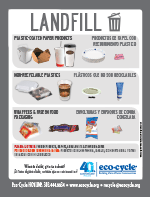 We sent 6.8 million tons to landfills for disposal. We generated an average of 8.5 pounds of discarded materials per person per day, far above the national average. Colorado Department of Public Health and Environment, 2010. Annual Municipal Solid Waste Recycling and Diversion Totals. Download more recycling and other environmental facts. Get the true facts about recycling with our "Ten Reasons to Recycle" publication. We also have a "Why Recycle?" brochure. Colorado is one of the worst states in the nation in terms of recycling and composting. Learn more about how our efforts are falling well short in the 2008 "State of Garbage in America." The environmental and economic premise of recycling is sound: re-using natural resources over and over again after they have been extracted from the earth makes good sense. By conserving the dwindling supply of these resources and protecting the few remaining undamaged ecosystems left on the earth, we are preserving them for future generations. Overall, the processes used to make consumer goods from recycled material instead of raw resources is much more energy and water efficient. For example, recycled paper uses 60-70% less energy than virgin pulp and 55% less water. Also, making recycled products reduces greenhouse gas emissions and the need to build landfills. Consumer products do not benignly arrive on store shelves with no impacts attached. In fact, making goods from natural resources can cause great harm. The destructive nature of mining, logging and drilling in fragile natural habitats to produce goods that will only be used once and then thrown away is extremely wasteful. For instance, for every garbage can placed at the curb, there are 71 cans of waste created in the extractive and industrial processes used to convert raw materials into finished products and packaging. Simply put, making paper from paper, cans from cans and plastic from plastic is infinitely kinder to the earth than clearcutting a forest in the Pacific Northwest, mining for bauxite ore in South America or drilling for oil in the Arctic National Wildlife Refuge. Recycling not only saves precious resources but also avoids the toxic processes used to turn these resources into consumer products. For example, producing paper from trees requires chlorine to remove lignin from wood. This process produces dioxins, a known carcinogen. On the other hand, recycled paper already has the lignin removed and only requires using hydrogen peroxide to remove ink. Keeping waste out of landfills also makes economic and environmental sense. One in five Environmental Protection Agency Superfund cleanup sites is a landfill. Contaminated with tons of toxic material, these landfills have cost taxpayers millions of dollars to clean up and monitor, a process that is likely to continue for many decades into the future. For industry experts, the question isn't if a landfill will leak toxins, but when. Therefore, recycling to avoid landfill disposal helps avoid environmental and public health threats down the road. Although recycling makes far more sense from an economic, industrial and environmental perspective, the extraction industry is heavily subsidized by taxpayers which forces recycled products to compete on an unlevel playing field in the marketplace. Because of this recycled products can sometimes cost more than their virgin counterparts. An integrated approach to recycling and waste reduction can provide appreciable cost savings to businesses. Initial costs to get the service "up and running" will, in the long run, be offset by reduced trash disposal fees and less waste creation. Such a visible commitment to the environment will also result in intangible benefits to employee morale and your company's public perception. Start-up costs, which in many cases are covered by the monthly charge paid to a service provider, can include the purchase or leasing of recyclables storage containers, container signage and employee education literature, and the cost of transporting recyclable materials to an off-site processing facility. These are the same costs one would expect when contracting for trash disposal service. Recycling at its simplest is transferring material out of the waste stream and giving that material new life to be re-used or re-manufactured into new products. Thus, as the volume of trash generated decreases, a company's associated cost of disposing of that trash will also decrease. Paramount to establishing a successful business recycling program that maximizes cost efficiencies is active employee participation. This can benefit your program and bottom line in two ways: the more your employees both recycle and reduce the amount of waste they create in the first place, the more your trash disposal cost will decrease. Integrating recycling and waste reduction techniques into your daily operating procedures and the culture of your business will ensure that your employees are saving the company money while they do the right thing for the planet. Ongoing employee education becomes the primary vehicle to ensure the success of your program. The bottom line: A business recycling and waste reduction program can be cost effective if it is carefully planned and coordinated with staff and employees. While this may appear to be a daunting task, numerous resources exist to assist with the development of an efficient program with achievable goals. Why can't I recycle all plastics? 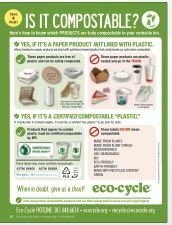 Just as with different types of paper, all plastics could be recycled if there were a market, i.e. a manufacturer who would use them to make a new product. There are some problems with plastics recycling that limit the market for some types. Why do most plastics have a recycling symbol on them if they can't be recycled? Good question. The recycling industry has been butting heads with the plastics industry over this misleading practice, unfortunately with no results. The symbol is meant to indicate the type of plastic, not its recyclability. Are the plastics I bring in REALLY being recycled? Yes, if you bring us what we ask for. Any non-recyclable plastic that you leave at the drop-off center will be landfilled and Eco-Cycle will have to bear the cost of disposing of your garbage. So, please don't try to "slip it in" on Eco-Cycle. 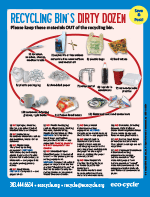 Please recycle only acceptable plastics through your curbside program or at the drop-off center. What are the problems with recycling plastics? When glass, paper and cans are recycled, they become similar products which can be used and recycled over and over again. With plastics recycling, however, there is usually only a single re-use. Most bottles and jugs don't become food and beverage containers again. For example, pop bottles might become carpet or stuffing for sleeping bags. Milk jugs are often made into plastic lumber, recycling bins, and toys. A recent development has been the bottles-to-bottles recycling of "regenerated" pop bottles. Though it is technologically possible to make a 100% recycled bottle, there are serious economic questions. Also, some critics claim that the environmental impact of the regeneration process is quite high in terms of energy use and hazardous by-products. Currently only about 7% of all plastics generated is recycled compared to 62% of paper, 25% of glass and 35% of metals. Recycling papers, glass and metal, materials that are easily recycled more than once, saves far more energy and resources than are saved with plastics recycling. Why is each Community's curbside program different? Curbside recycling pick-ups can be handled in a variety of ways. In many communities the city has chosen to make recycling a citywide service available to everyone. They may do this by contracting with one or more haulers to provide the pick-up as Louisville and Lafayette have done, requiring haulers provide recycling service as Boulder has done, or the city itself may provide this service to everyone as Longmont does. In other communities curbside recycling pick-up may be available through independent trash haulers. Many trash haulers now have a separate fleet of trucks to pick-up recyclables that are then hauled to a processing facility. In these communities the service needs to be arranged by each individual resident. This of course takes both awareness and initiative on the resident's part. Because different companies or entities do the hauling of recyclables, different items get picked up. What they pick up depends on what their trucks are equipped to handle, what the processing facility they transport to can handle and how aggressive they are in their waste reduction efforts. How can I reduce my Junk Mail? Stop Junk Mail for GOOD! Take back your mailbox by reducing unwanted mail. List brokers sell or rent your name to thousands of businesses each year, resulting in an average of 41 pounds of junk mail pouring into every American mailbox every year. You can stop this deluge of waste.